China’s growing space prowess shows no signs of slowing, the U.S. Department of Defense said in its annual report to Congress on military and security developments involving the People’s Republic of China. The Pentagon has been carefully monitoring China’s space activities, and pointed out that last year, the country conducted a total of 18 space launches and expanded its space-based intelligence, surveillance, reconnaissance, navigation, meteorological and communications satellite constellations. The report explains that China is keen on improving its capabilities "to limit or prevent the use of space-based assets by adversaries during times of crisis or conflict." Helvey said the Pentagon welcomes the actions that China has taken to improve openness and the amount of information that’s made available about its military, including the regular publication of defense white papers. "However, many uncertainties remain, which only underscores the importance of building a military dialogue with China that is sustained and substantive," he told reporters. David F. Helvey, deputy assistant secretary of defense for East Asia, briefs reporters about the military and security developments involving China during a news conference held at the Pentagon on May 6. China launched six satellites for its Beidou navigation constellation in 2012. These six satellites completed the regional network, as well as the in-orbit validation phase for the global network, expected to be completed by 2020. In 2012, China launched 11 new remote sensing satellites, which can perform both civil and military applications. China has developed a large constellation of imaging and remote sensing satellites under a variety of mission families. These satellites can support military objectives by providing situational awareness of foreign military force deployments, critical infrastructure and targets of political significance. China will continue to augment its orbiting assets, with the planned launch of 100 more satellites through 2015. These launches include imaging, remote sensing, navigation, communication and scientific satellites, as well as manned spacecraft. China is pursuing a variety of air, sea, undersea, space, counterspace and information warfare systems, as well as operational concepts, moving toward an array of overlapping, multilayered offensive capabilities extending from China’s coast into the western Pacific. China’s 2008 Defense White Paper asserts that one of the priorities for the development of China’s armed forces is to "increase the country’s capabilities to maintain maritime, space and electromagnetic space security." Further, China continues to develop the Long March 5 rocket, which is intended to lift heavy payloads into space. LM-5 will more than double the size of the Low Earth Orbit (LEO) and Geosynchronous Orbit (GEO) payloads China is capable of placing into orbit. To support these rockets, China began constructing the Wenchang Satellite Launch Center in 2008. Located on Hainan Island, this launch facility is expected to be complete sometime this year 2013, with the initial LM-5 launch scheduled for 2014. SPACE.com contacted several leading China experts to get their input on the newly issued report. "What is clear, from other Chinese writings and the DOD’s report, is that the ‘new historic missions’ — which lay out the roles and missions of the People’s Liberation Army (PLA) — continue to be in force," said Dean Cheng, a research fellow on Chinese political and security affairs at the Heritage Foundation, a conservative public-policy think tank in Washington, D.C.
Those "new historic missions," Cheng told SPACE.com, "include the need to establish space dominance and information dominance. The latter includes space dominance as part of its tool kit." Cheng said there is no reason to think the PLA is not interested in pursuing these goals. "As important, though, there is alsono reason to think that the PLA is somehow doing this in defiance of, or without the knowledge of, the Chinese government." Indeed, those sorts of arguments — often put forth by folks who seem to know little about how China is actually governed, Cheng said — raises an interesting question: "Should we feel reassured by the possibility that the PLA is notfirmly under the control of the civilian leadership of the People’s Republic of China?" One item in the Pentagon report points to PLA writings that emphasize the necessity of "destroying, damaging and interfering with the enemy’s reconnaissance...and communications satellites," suggesting that such systems, as well as navigation and early warning satellites, could be among the targets of attacks designed to "blind and deafen the enemy." That analysis of Chinese literature "suggesting satellites as targets" caught the eye of Joan Johnson-Freese, professor of National Security Affairs at the Naval War College in Newport, R. I. “I am always baffled at why it would be thought that a country would take out a satellite — creating debris with the potential to damage their own satellites — when taking out the ground station is easier, yields the same result, and without the debris-creation issues," Johnson-Freese said, noting that the opinions she is expressing are her own and do not reflect the views of the U.S. government, the Department of the Navy, or the Naval War College. Johnson-Freese pointed out that China has not conducted further orbital-debris-generating anti-satellite (ASAT) tests since a widely condemned 2007 operation that created about 3,000 new pieces of space junk. "I think [China has] learned from the U.S. and India that the way to do ASAT tests without international condemnation is to call them missile-defense tests and conduct them in a manner nonthreatening to other space assets," she explained. "So, that China hasn’t done a high-altitude kinetic test means little in terms of capabilities development…but does perhaps show that they are learning to be more responsible/responsive to international norms," Johnson-Freese told SPACE.com via email. Johnson-Freese also said the dual-use potential of most space technology continues to make it difficult to determine what its main purpose is meant to be. That's especially true for remote sensing and tracking systems, because China needs tracking for its human spaceflight program. "This Pentagon report says that unspecified 'PLA writings emphasize the necessity of' using anti-satellite weapons to 'blind and deafen the enemy.' However, one can easily find many comparable discussions in American writings," said Mark Gubrud, a postdoctoral research associate in the Program on Science and Global Security at Princeton University. 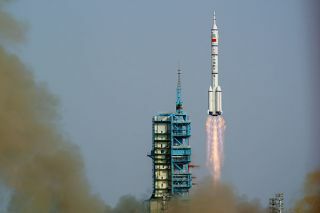 China launches the Tiangong-1 space lab module Sept. 29, 2011 atop a Chinese Long March 2F rocket from the Gobi desert. China has demonstrated its ability to develop and test ASAT weapon technologies, Gubrud said. The nation destroyed one of its own dead weather satellites in 2007, for example, and three years later took out an object that was not in orbit. "The U.S. has similar ASAT-capable weapons, which have been tested dozens of times and which are operationally deployed in dozens and hundreds," Gubrud told SPACE.com. "China is not known to have perfected such weapons and operationally deployed them in force." On the other hand, Gubrud added, the report documents China’s increasing reliance on military and civilian space systems. This would seem to give the Chinese an interest comparable to U.S. interests in the survivability and resilience of space resources, he said. "I maintain that the only way to secure this interest is by combining defensive measures, such as hardening and backups, with strong arms control which bans both satellite weapons and anti-satellite weapons," Gubrud said. "If the threat to satellites is limited, defensive measures can be effective, but if it is unlimited, the offense will win." Gubrud said the Pentagon report cites official Chinese policy that stresses, rather deceptively, that space weaponization is not inevitable. I would like to see the U.S. engage in a similar level of deception," Gubrud said. "Let’s have American and Chinese diplomats gather with those of other nations and pretend to negotiate a treaty banning space weapons and their use. Since in reality it is impossible to develop and test space weapons without other major powers — and probably the whole world — knowing, the generals would have to abide by this treaty just as if it were a real one." Leonard David has been reporting on the space industry for more than five decades. He is former director of research for the National Commission on Space and co-author of Buzz Aldrin’s new book, “Mission to Mars – My Vision for Space Exploration,” published by National Geographic.Follow us @Spacedotcom, Facebook or Google+. Originally published on SPACE.com.